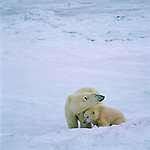 Collection of Polar Bear images from the Arctic. A Polar Bear rests in the snow. Two adult male polar bears play fight in the snow.